Can Bears And Humans Co-Exist? 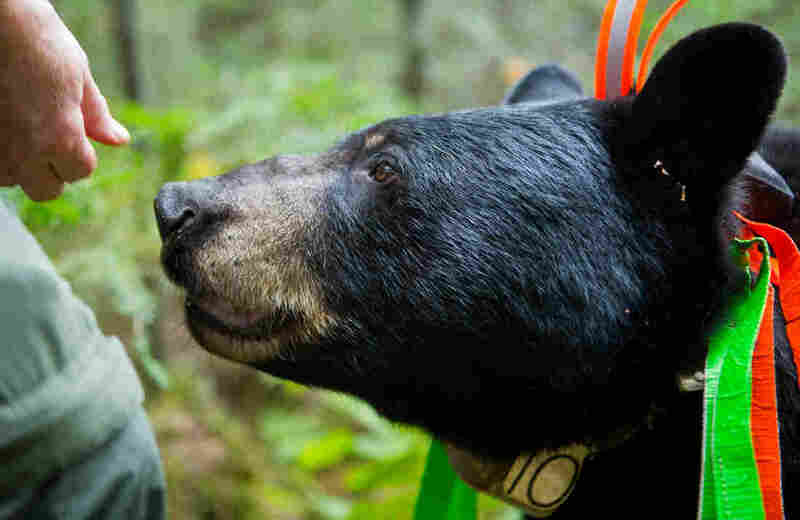 : Shots - Health News A photographer who walks deep into the woods in search of a wild bear wonders if his curiosity will overcome his fear. Can bears and humans co-exist? Invisibilia: Should Wild Bears Be Feared Or Befriended? Wildlife Research Institute biologists Lynn Rogers and Sue Mansfield use an antenna while trying to locate a radio-collared bear in the woods near Ely, Minn. in 2012. This week the podcast and show Invisibilia examines the nature of reality, with a Silicon Valley techie who created apps to randomize his life; a psychologist who trains herself to experience the world like dogs do; and a wildlife biologist who thinks bears aren't dangerous. 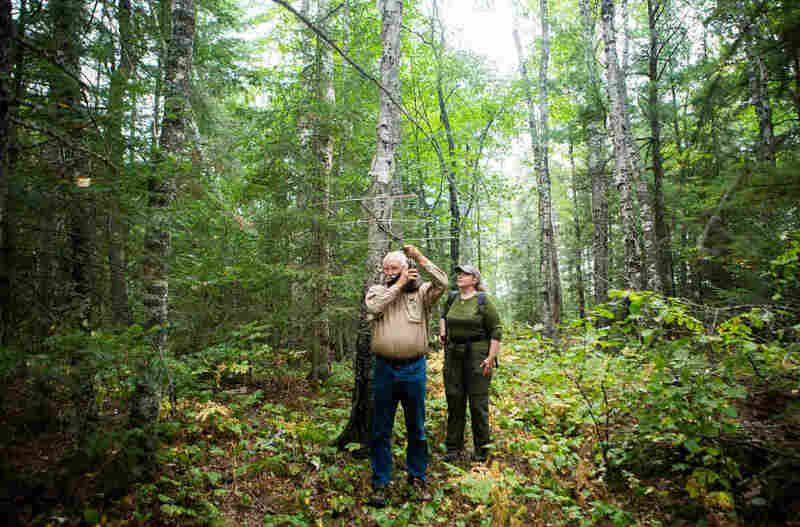 When you live in northern Minnesota, wildlife is usually no big deal. A giant bull moose casually strolled through our neighborhood in Duluth a couple summers ago, past screaming and slack-jawed kids at a nearby park. Wolves also have ventured into town, occasionally killing dogs that strayed too far from their owners. Deer are as common as flies, and I only seem to notice them when they jump out in front of my car. But bears are different. I hadn't seen one in town, while driving or even at the zoo. 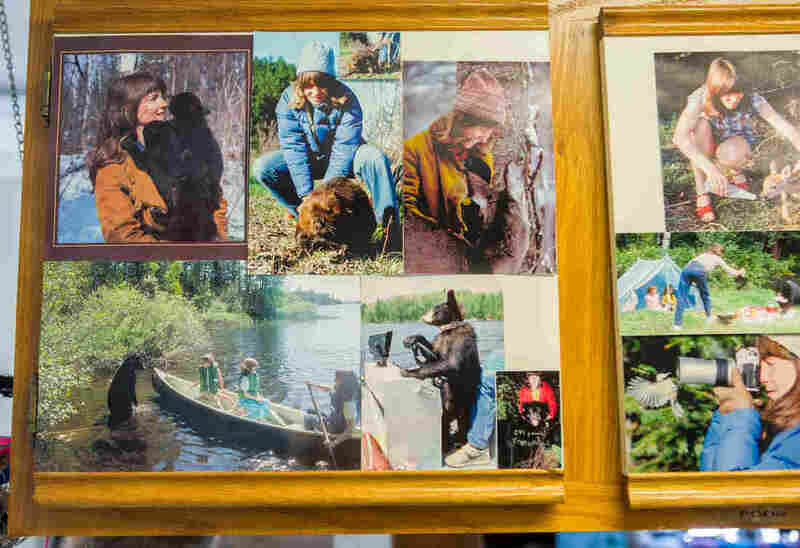 So in 2012, when Minnesota Public Radio reporter Dan Kraker asked if I wanted to join him as he went out with wildlife biologist Lynn Rogers to find a bear, I jumped at the opportunity. Photographs of Rogers' long relationship with northern Minnesota bears and other animals adorn one of the cabinets at his Wildlife Research Institute. My excitement at seeking out a black bear in the wild would seem to be at odds with my innate instincts to flee when confronting creatures more than twice my size that have the ability to turn me into lunch meat. But I felt safer tagging along with a researcher who had experience with bears. Rogers, fellow biologist Sue Mansfield, Dan and I all met at Rogers' Wildlife Research Institute near Ely, Minn. We talked about his work and what he had planned for the day. They fired up their GPS tracking devices, found a lock on June, a pregnant black bear whose radio collar needed a new battery, and we drove off. 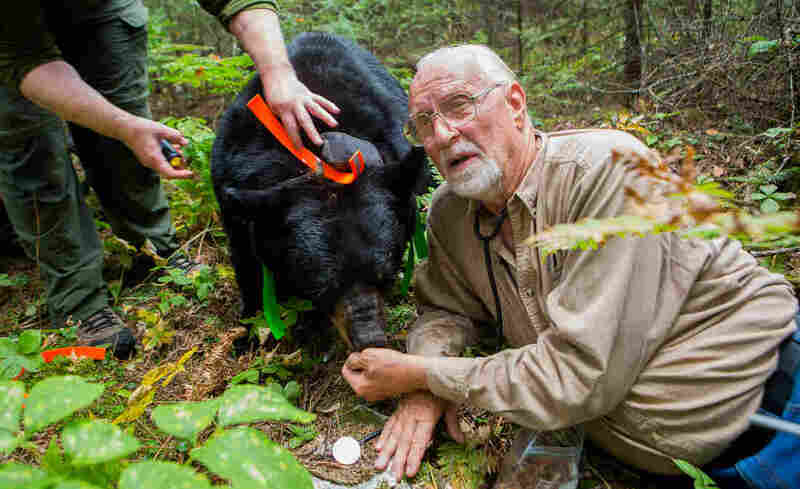 Rogers hand feeds June, a 300-plus-pound pregnant black bear. After 45 minutes, we had to get out and hike through the sparse aspen and birch forest, which had been a former logging site. They lost the signal a number of times, but after about an hour we narrowed in on June's location until we suddenly saw a black speck moving about 50 yards away. My excitement suddenly waned. I felt a lot more cautious than I had been an hour earlier when we were trudging through the woods flicking ticks off our sleeves and swatting mosquitoes away from our faces. Lynn and Sue kept on moving toward the bear like nothing was unusual, until June was standing right in front of us. They took out food and started hand-feeding her. June looks at the food being offered by wildlife biologists. In 2013, June was shot and killed by a hunter near Ely. I won't lie and say visions of June taking a chunk out of their hands didn't cross my mind. It just seemed so odd to encounter a bear in the woods and not have bear or human take off running away from each other. But June was so calm with Lynn and Sue as they prodded her with instruments to determine heart rate, temperature and other information. Then Lynn said we could pet her. The idea of petting a wild bear in the woods seemed so surreal to me. I reached out and patted the top of her coarse head. June lifted her eyes and looked at me. In that moment, I wasn't afraid. Within a few minutes, Lynn and Sue were done and we were on our way out of there. This time we were using the GPS to find the way back to the van. The scene still feels so odd because none of it seemed natural. Me not running from the site of a wild black bear. The black bear not running from me. People petting and feeding the black bear in the woods like it was a dog. But between fear and excitement, curiosity won out. Still, it hasn't changed how I interact with bears. I keep a distance. Derek Montgomery is a freelance photographer based in Duluth, Minn. His work has appeared in such publications as The New York Times, The Wall Street Journal, and Minnesota Public Radio.